I’ve disliked foundation since high school and am always on the lookout for more natural-looking, less mask-like alternatives. I was on the mineral makeup bandwagon for a brief time, but these days I’m a huge fan of BB creams. BB creams are all the rage in Asia, and for good reason: these miraculous multi-taskers even out skin tone and moisturize while boasting a slew of skincare benefits (and they make getting ready in the mornings a breeze). No wonder Korean actresses swear by them. Garnier Skin Renew Miracle Skin Perfector BB Cream is the latest one I’ve tested, and it’s great stuff. The new combination/oily skin formula promises to absorb oil and minimize pores—all while also evening, hydrating, and protecting skin. Its key ingredients include perlite, an oil-absorbing mineral derived from volcanic rock; mineral colour pigments, which even out skin tone and deflect light; caffeine, which wakes up a tired complexion; and vitamin C, which has antioxidant properties, brightens and protects. I was concerned that a mattifying, oil-absorbing product would dry out my skin or leave it looking ghastly, but I was pleasantly surprised by Garnier BB Cream. The unscented formula goes on light and leaves a velvety even finish when I apply it in the morning. It hydrates my cheeks effectively while combatting T-zone shine throughout the day. The mineral pigments in the light/medium shade blend into my fair Asian skin tone flawlessly and never look ashy, unnatural or overdone. I finish the day looking as good as when I started it. 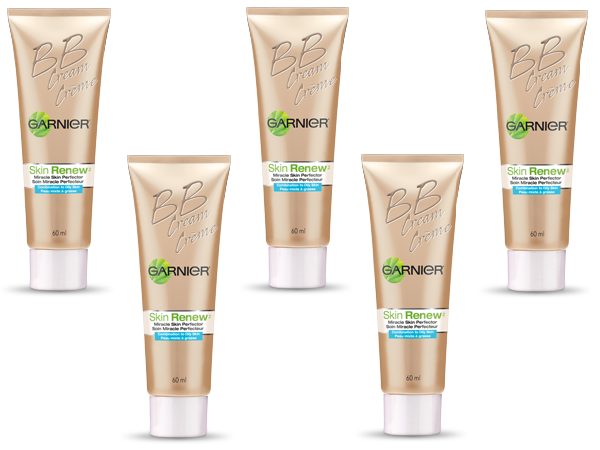 Garnier BB Cream’s new formula is definitely a terrific choice for preventing makeup meltdown in the summer. Disclosure: This post was brought to you by Garnier via Glam Media Canada. The opinions expressed herein are those of the author and are not indicative of the opinions or positions of Garnier.